We know, now, what happened to Palmyra. 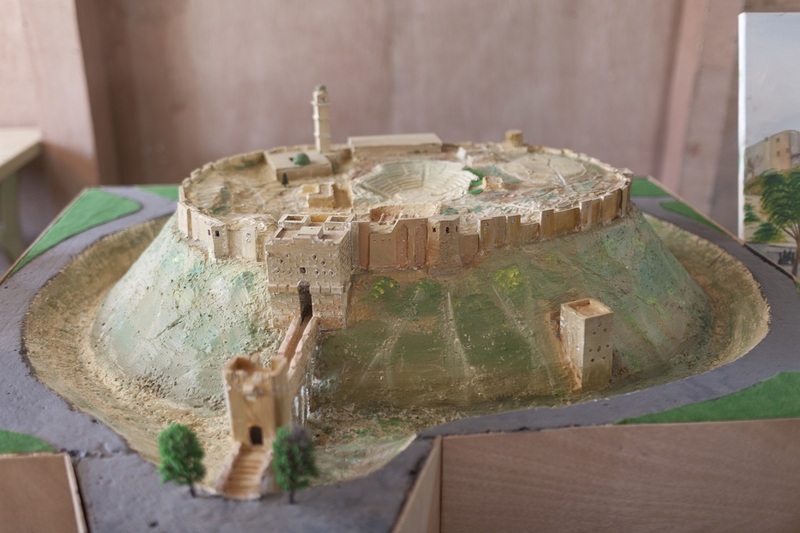 But the ancient city was still standing in the winter of 2014 when Mahmoud Hariri began recreating it in clay and wood. 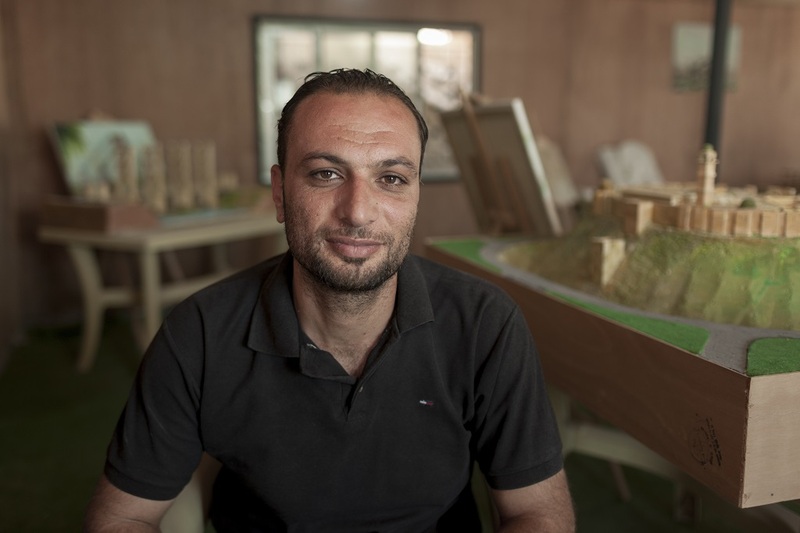 Hariri, 25, was working on a project with Art from Zaatari, an artists’ group located in Jordan’s Zaatari refugee camp. The camp, located just a few miles from the country’s border with Syria, has in the past few years become a city unto itself — with approximately 80,000 people living there; it has schools, clinics and mosques. And, of course, artists. 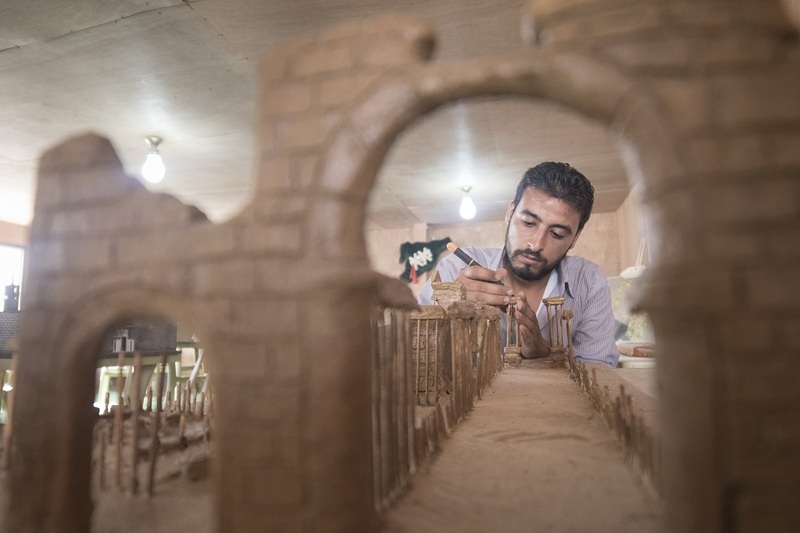 The group decided to create small sculptures that replicated Syrian monuments, knowing their real-life counterparts stood in the path of warring forces. Hariri chose Palmyra, the ancient city whose ruins formed a UNESCO World Heritage Site and hosted some of the best-preserved Roman antiquities in the world. He began marking out, inch by inch, the details of a city in miniature. 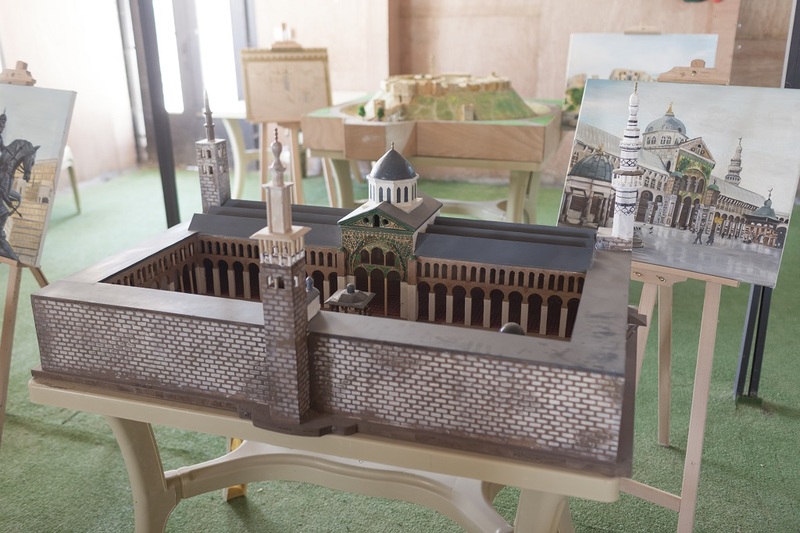 Having worked as an art teacher in Syria before he left, Hariri methodically worked with kebab skewers and miniature bricks of clay to recreate the columns of a city thousands of years old. “I wanted to show my country’s history and culture to the world,” he told me via Facebook. But in the spring of 2015, just a few months after he began, the Islamic State group invaded the city, and within weeks the piece had become a reminder of what was lost. The group destroyed irreplaceable artifacts, the historic Temple of Bel and at least six tombs, in addition to other ancient sites. The damage was devastating to Syrians and scholars around the world. Hariri said he wanted Palmyra to stay visible even as parts of it lay in ruins. “Syrian identity is important to me. I participated in this project so this identity did not become erased,” he said. As war in Syria pushes millions of people out of the country, Zaatari has developed into a kind of metropolis itself, one beset by problems — former residents have spoken out about difficult living conditions, including a a lack of electricity, water and other services. People who initially expected to be there for months have lived there for years, including some children who were born in the camp. Many will not, for the foreseeable future at least, see any of Syria’s most treasured sites in person. This was all on Ahmad Hariri’s mind when he decided to organize Art from Zaatari, inspired by the work he saw by his friends in the camp. 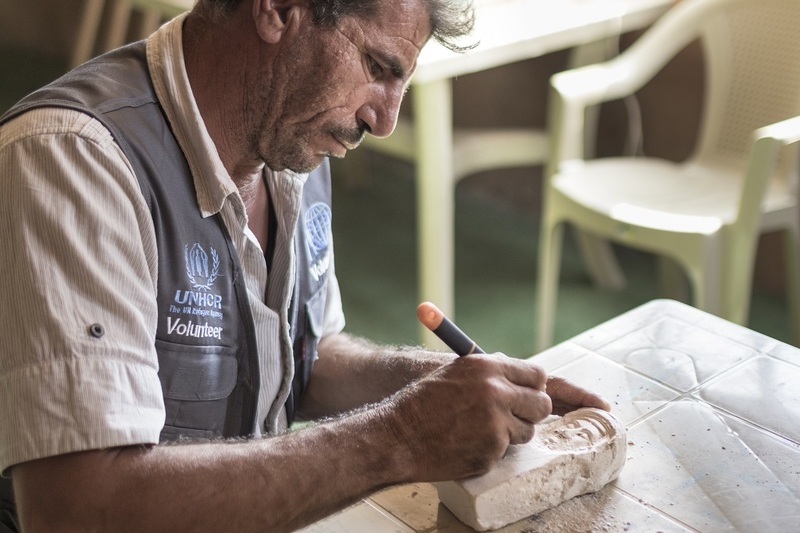 A 31-year-old network engineer that has lived in the camp since April 2013, Ahmad is not an artist himself. “The artists are my friends, so I started to follow their work,” he said via Facebook. 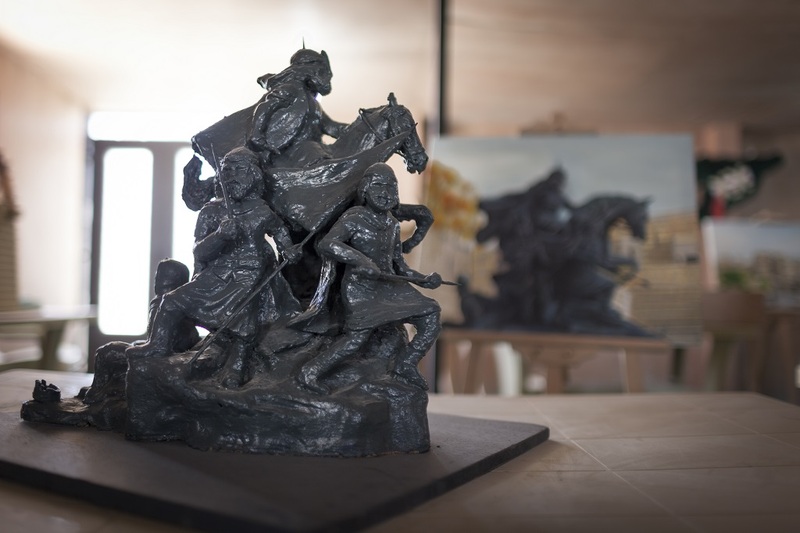 Ahmad and most of the eight artists working on the project are from Dara’a, the southern city where a harsh government crackdown on protests in early 2011 is credited with fanning the early flames of the revolution. Iyad Sabagh, 29, arrived in Zaatari from Dara’a in late April 2013. He said he wanted to help preserve Syrian culture however he could. “The war is ruining these historical sites,” he said via Facebook. For months, the artists used whatever materials they could find to create the sculptures: scrap wood, plaster of Paris, stones. 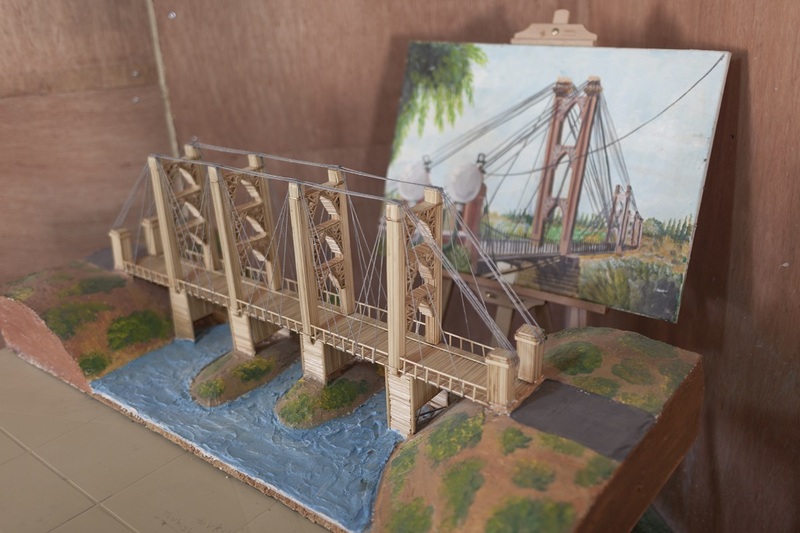 Sabagh created a model of Deir ez-Zor suspension bridge, a bridge that once crossed the Euphrates River in the eastern city of Deir ez-Zur, using sticks. The bridge was destroyed in shelling in May 2013. Hariri also recreated the Bosra Theater, an ancient Roman theater located in Dara’a, and the Statue of Saladin, a historic statue in Damascus. The project also had two additional stages, according to organizer Ahmad. In the second stage, artists created various types of Syrian folk art in paintings, drawings and multimedia pieces. “The artwork in this exhibit attempts to capture ancient Syrian folk traditions, some of which continue [in] the daily lives of modern Syrians,” he said. For the second and third stages, Hariri created 7 paintings using acrylic and oil, and drawings using ink and pencil. Sabagh created 21 paintings, including 4 pieces using pencil, 4 oil paintings, and 13 acrylic paintings. 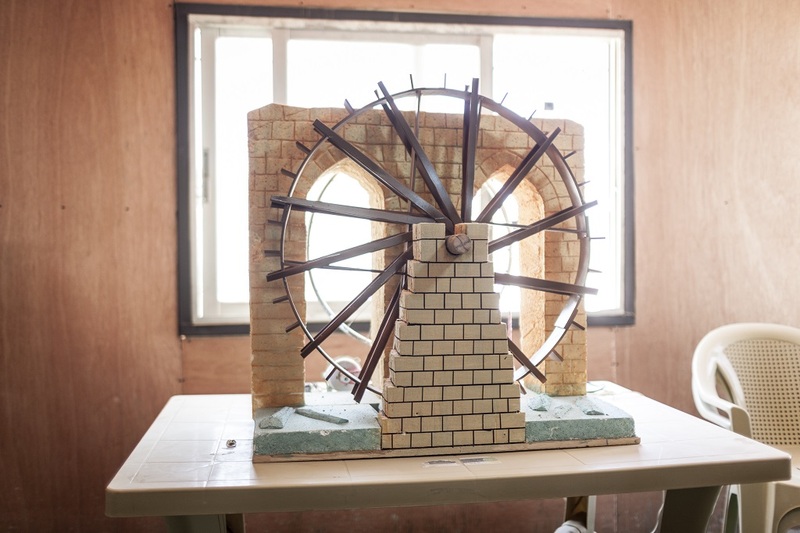 The group displayed its work at a community center in Zaatari in December. 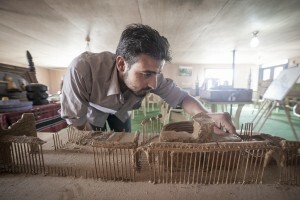 Dunmore, who interviewed the artists, said the project showed determination among the artists living in Zaatari. “To keep doing the thing that you love, whatever materials you have to work with, just shows resilience,” he said. See more images of the project below. 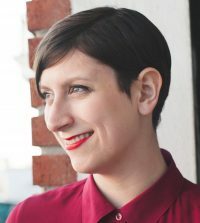 Special thanks to Julie Whittaker, who translated interviews from Hariri, Hariri and Sabagh. Explore more of our Syrian Voices series which highlights Syrian artists producing work around the world.